...or barbecued ribs--and there is no way I could quit seafood. I mean really, I visit an island a few+ times a year, and you think I'm not eating seafood?! So with conviction, I can tell you guys that I will NEVER be a vegetarian. Having said all of that, I DO admire vegetarianism and realize there are some health benefits to be had by going that route. So as a quest of broadening me and my family's horizons--I've decided that we will have 2 meatless dinners a week. By 2, I mean that I'll be making one vegetarian meal and having leftovers another day. I'm curious as to how vegetarians organize a meal, because to me, it seems like they just stick a bunch of "side dishes" together and call it a meal. lol Now, I realize that's my meat-eating way of thinking, that a dish without meat is somehow a "side dish"--so I would like to see if this venture will change my way of looking at food. So, the first thing I did was buy a vegetarian cookbook. 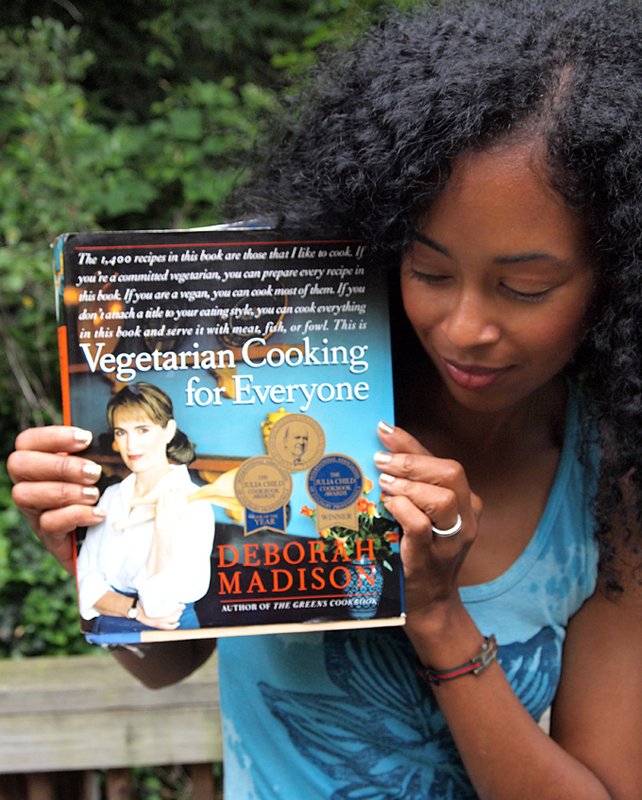 I bought "Vegetarian Cooking for Everyone " by Deborah Madison. It was mentioned a few times in reviews of other vegetarian cookbooks so I did some research and bought it off of eBay actually. There are a few other vegetarian cookbooks I plan to get, as well as this "The Indian Slow Cooker: 50 Healthy, Easy, Authentic Recipes " book I've been eyeing. I am all about crockpot cooking--not to mention, I find that I enjoy most vegetarian Indian dishes (so it should be useful for my vegetarian and non-vegetarian days). I'll let you guys know how it goes and will definitely share some recipes! P.S. That book is MASSIVE, and it doesn't have pictures. :/ I still plan to use it, but am getting a simpler vegetarian cookbook soon with pics. I'll will let you all know which one I get! I was at dinner last nite with a friend who I found out "doesnt eat meat" I felt confused when she said that. My bro calls people like that "Tree Huggers" lolol But like you I could see myself having 1 MAYBE 2 meatless meals a week. I'm with you on the bacon, ribs and seafood...LOL But I'd like to add more meatless meals to our menu, too. I'll check out this cookbook. Does it have photos? I tend to prefer cookbooks with color photos of most -if not all-of the recipes. I like to see what a dish is supposed to look like. That book is MASSIVE, and it doesn't have pictures. :/ I still plan to use it, but am getting a simpler vegetarian cookbook soon with pics. I'll will let you all know which one I get! I'm strongly thinking about becoming vegetarian after reading about the FDA not regulating the chicken anymore and the deformed looking seafood in the Gulf now. I really wasn't surprised about the latter because come on, the effects of that oil spill didn't just disappear. I feel sorry for the fishermen in the area. I loved bacon, and was never a big fan of ribs, but no longer eat meat, but I do eat seafood. The hardest thing I found in being a vegetarian was planning my meals. Ultimately - I found that vegetarian meals are based around TYPES of dishes: cream-based pasta, oil-based pasta, baked pasta, stir-fry, pizza, soup, another baked dish, etc. When thinking like THIS you create a meal that meat-lovers won't be left thinking..."Uh, I'm still hungry!" Which was definitely my thought process for the first couple of months. I personally cook a lot of "meat" meals and either substitute meat with beans, or omit it all together when applicable. Good luck! I'm someone who mainly eats a vegetarian diet although I wouldn't call myself a vegetarian. There's a youtuber named Naptural85 that has a vlog where she lists recipes, you may be able to gather some recipes from there. A cookbook without pics wouldn't work for me. I often eat meatless meals without even thinking about it but still enjoy seafood and chicken. I could see maaaaayyyybe trying to go meatless once a month, but I would definitely need pictures! I hope you let us know how this new challenge goes.